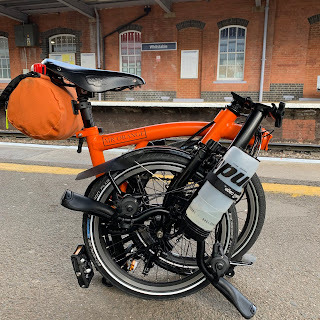 My Orange Brompton: Dancing to Lady Ga Ga, 'Poker Face' nearly killed me! Dancing to Lady Ga Ga, 'Poker Face' nearly killed me! Those of you with a bicycle will know that if you use it every day, it does tend to get dirty quite rapidly. Living in London with the British weather the way it is, this can of course make bicycles filthy. Having spent hundreds of pounds on my beloved Brompton folding bike, I decided I would give the bike a damned good clean. I lovingly cleaned all the dirt off the tyres and frame and much to the amazement of my onlooking family cleaned the spokes, rims and hub. Everything was absolutely spotless and in 'as new' condition. Very proud of myself I got out a tin of 'GT-85' and proceeded to spray the wonders of this lubricant over the chain. Turning the wheel I could hear the now silky smooth running of a perfectly engineered bike - now cleaned by yours truly. Feeling slightly guilty - as this had all taken over two hours, I plugged in the Xbox 360 Kinect, opened the tray of the Xbox 360 and put in 'Dance Central' specially designed for the new Kinect. From the above you will no doubt have guessed that I am of a technology aware disposition. (In other words, I had the first go). I choose an easy dance to break myself in. This was, Lady Ga Ga's, 'Poker Face.' Watching the dancer animated on our television I soon found my stride. To my surprise I was able to dance and keep in time with the character, who urged me on as I was doing so well. It then got to a part in the track where I was permitted to, 'freestyle.' This is where things went terribly wrong. With a rush of blood to the head I went for it. All the 80's body popping, robot and semi breakdancing/disco moves were unleashed in an uninhibited and energetic frenzy! It was when I attempted Michael Jackson's, 'Moonwalk' that I almost felt my last moment had come! (I had been cleaning my Brompton with, 'GT-85.' I did not think to lay down newspaper and what have you, so some of it went directly on to an already polished wooden floor). The 'Moonwalk' was going better than expected. Too well in fact. My feet seemed to have no friction. I could actually do the 'Moonwalk.' Elated I went for a longer walk and strayed into the danger zone. I hit the floor, landing straight on my back. I was okay apart from being totally winded and unable to talk or breathe. My family at seeing this were in hysterics and were unable to talk or breathe! If you are going to clean your bike over the holiday please put down some newspaper. If you don't, you may suffer my fate! Many thanks! This entry could be classed as part of my back catalogue and I am glad you liked it. Keep reading and tell your friends!